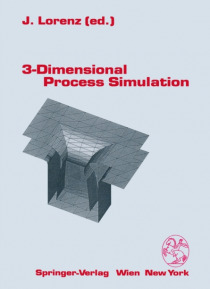 This book contains the proceedings of the International "e;Workshop on 3D Process Simulation"e; which was held at the Campus of the University Erlangen-Nuremberg in Erlangen on September 5, 1995, in conjunction with the 6th International Conference on "e;Simulation of Semiconductor Devices and Processes"e; (SISDEP '95). Whereas two-dimensional semiconductor process simulation has a… chieved a certain degree of maturity, three-dimensional process simulation is a newly emerging field in which most efforts are dedicated to necessary basic developments. Research in this area is promoted by the growing demand to obtain reliable information on device geometries and dopant distributions needed for three-dimensional device simulation, and challenged by the great algorithmic problems caused by moving interfaces and by the requirement to limit computation times and memory requirements. This workshop provided a forum to discuss the industrial needs, technical problems, and solutions being developed in the field of three-dimensional semiconductor process simulation. Invited presentations from leading semiconductor companies and research Centers of Excellence from Japan, the USA, and Europe outlined novel numerical algorithms, physical models, and applications in this rapidly emerging field.